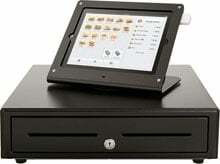 BCI Paperless Package for Square Register - Square Register hardware to turn your Apple iPad into a Paperless Cash Register. Includes one APG Vasario manual cash drawer and Heckler Windfall C Stand. Does not include Apple iPad, Square Register reader, or Square Register app. You must sign-up for the free Square Register reader and app online directly from Square in order to run this POS System. The BCI PAPERLESS-SQUARE-KIT is also known as PAPERLESS-SQUARE-KIT	or PAPERLESSSQUAREKIT	.